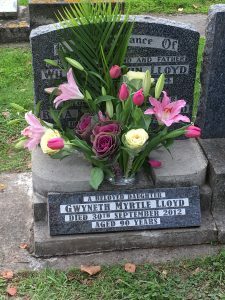 April 2017, an interment of ashes for Gwyneth Myrtle Lloyd. 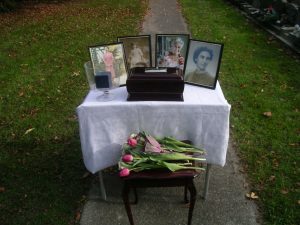 This remarkable woman specifically requested to be buried with her parents, and 4.5 years after her formal funeral, the family got together and we held a second ceremony to inter her ashes into her parents grave. This is a simple, fairly short ceremony with some poetry, some music, a committal and a blessing. Big thanks to Stephen and Charles from Lamb and Hayward Funeral Directors for their wonderful help. Not only preparing the grave for us, but also supplying the sound system and table. An additional headstone fitted perfectly, and fresh flowers made for a beautiful setting.